‘Micro’ is a term commonly used in Real Time Strategy games to signify taking direct control of your units, performing minor actions to maximize performance out of said units. In Rivals, due to the focus on fast paced skirmishes rather than the bigger economic Macro game, effective Micro is one of the key skills that separates a good player from a great player. 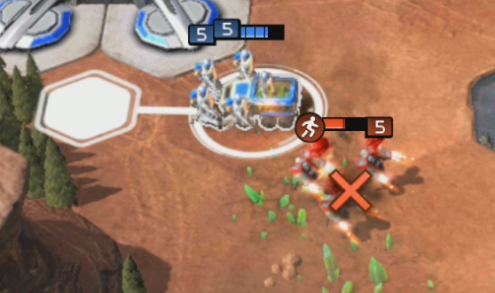 There are many types of micro techniques, one of the more prominent methods used in Rivals, particularly with ‘Aggro’ decks is body blocking. This is where you use your selected unit to restrict passage to a spot on the map by occupying two ‘hexes’ through movement. Notice the Predator continuously had it’s path rerouted, and there was no way it could get past the Rifleman squad. Practically all units are capable of body blocking in some form, with land units being able to block other land units, and air units being able to block other air units. One key notation of effectiveness however, is the movement speed. 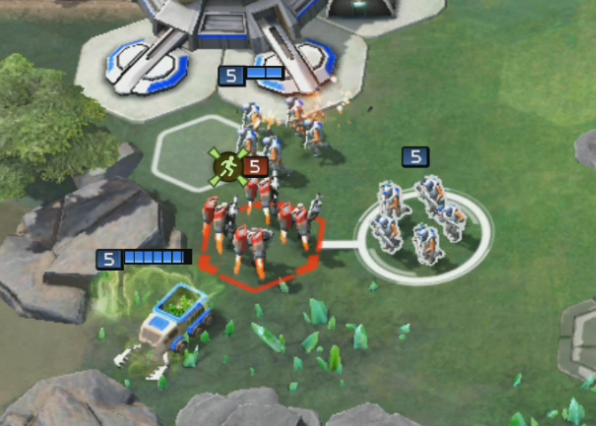 A slow unit will have a harder time blocking a unit faster than it, with the common outcome being the slower unit being ‘pushed’ out of the hex they are attempting to occupy. Body blocking can buy you those precious few seconds you need to finish charging a nuke and launching it at your opponent’s base, possibly winning you the game. This isn’t the only common use of micro, however, and to understand this next technique, we’ll have to briefly cover another topic. The majority of the units in the game need to ‘ready’ their weapons before they fire, which will require them to stop moving. Therefore, in situations where two identical units with the same levels engage each other, the unit who began the fight stationary will get the first shot off and will come out the victor. This is referred to as ‘Defender’s Advantage’ in the community. This mechanic amplifies the importance of placement of your troops on the battlefield, and can be the difference between you losing an encounter, or winning. Observe in this clip, as two Riflemen Squads defend against a single Shockwave trooper, where the Blue team come out with a positive trade. Compare this clip, where the Shockwave Trooper is the one defending instead. Defender’s Advantage can be vital in maximizing the survival and effectiveness of your troops. A common situation later on in the ladder, when GDI players have access to Jump Jet Troopers, is the Jump Jet Trooper rush, which can be devastating if not scouted early. But with efficient micro management of your troops, along with application of Defender’s Advantage, it can easily be countered. Here’s an example situation – The match has begun, and I started with a Rifleman scout – I then continue to build a Harvester right afterwards. But right as I deploy the Harvester, a Jump Jet Trooper squad fly past my Rifleman scout, making a bee-line straight for my shiny new Harvester. No problem, let’s just build another Rifleman and have him defend. It didn’t work! They kept moving their Jump Jet Trooper out of the way! As you can see here, the Jump Jet Trooper is faster, and with that speed combined with the competent micro from my opponent, they managed to chip away at my Harvester and destroy it before my Rifleman squad could stop it. There are ways around this, such as using two Rifleman squads to trap the Jump Jet Trooper. In this situation, if the Jump Jet Trooper wishes to continue firing on the Harvester, they will continue to take damage from the Riflemen. Thus either the Jump Jet Trooper retreats, or he loses his 50 Tiberium troop to two 10 Tiberium troops. But there’s a cheaper method still. Whilst you cannot move through enemy troops, you can have your own troops pass through each other, leading to effective defensive strategies. In this screenshot, I moved the Harvester through the Rifle Squad, causing the Jump Jets, who were targeting the Harvester, to move into firing range of the Riflemen. In this situation, the Riflemen did not have to move, and thus did not have to stop and prepare to fire. (This is the Defender’s Advantage mentioned earlier.) This gave the Riflemen ample time to tear down the Jump Jet Troopers. These are just a few basic methods of maximizing unit effectiveness through micromanagement. As with many things, practice makes perfect. If you truly want to climb the ladder and hang with the best, micro is a skill that you will have to hone.